Born in 1998, St. Petersburg. In 2014 he graduated at the Lyakhovitsky St. Petersburg Music School (Class of Vera Ovcharova). He is studying currently at the Special Music High School of Rimsky-Korsakov St Petersburg State Conservatory (Class of Olga Kurnavina and Michael Benediktov). 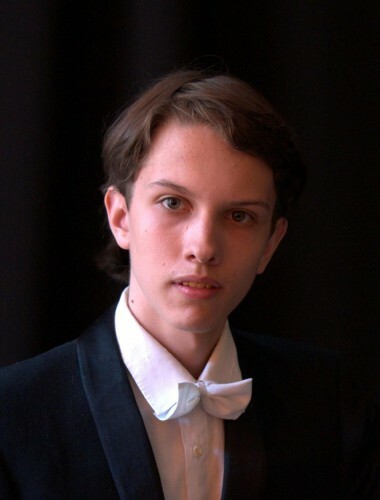 2014 - Winner of the Gavrilin International Youth Competition "I am a composer"
Fellow of «International Keyboard Institute & Festival» (New York) and the St. Petersburg Government Project, Laureate of Andrei Petrov Prize. He took part in master classes of Alexander Mndoyants, Garrick Olson, Jerome Rose, Nina Lelchuk, Peter Ovcharov, Boaz Sharon and Frederic Chiu. In 2015 he took place at the Summer Training Program at the College of Fine Arts at Boston University (Tanglewood Institute). Member of the St. Petersburg Music House Program since 2016.